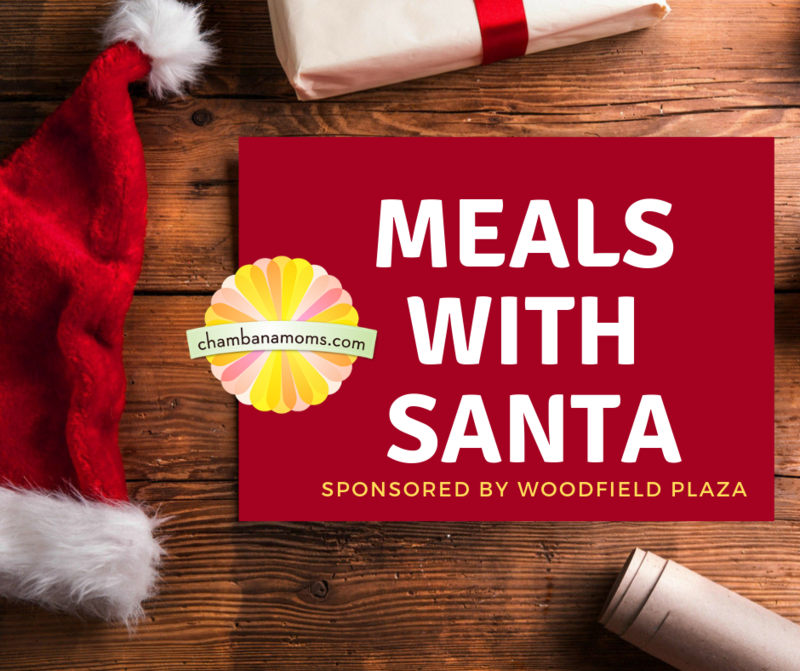 Thank you to Woodfield Plaza for helping us bring you all things SANTA in Champaign-Urbana on chambanamoms.com this holiday season! Today, we’re bringing you our guide to breakfast with Santa in the Champaign-Urbana area. Of course, some meals include breakfast and lunch and even BRUNCH. FREE Breakfast with Santa in Champaign: Hosted by the Rector Real Estate Team. Chelsea Grace Photography will be available for free family portraits with Santa! Saturday, Dec. 1 at Keller Williams Office, Champaign (address in link above). Breakfast with Santa in Mahomet: Enjoy donuts and milk, crafts, activities and a visit with Santa on Saturday, Dec. 1 from 8:30-10 a.m. at the Mahomet-Seymour High School Cafeteria. Parents are welcome to bring cameras for a photo opportunity with Santa. See link for ticket info. Tuscola Christmastown: See Santa on Friday evening, Nov. 30 at the Community Building and again on Saturday immediately following the Tuscola Christmastown parade for pictures on Dec. 1 (both free). Or, there’s also Breakfast with Santa on Saturday morning in Tuscola (nominal fee). Please bring your own camera for pictures! Santa Pancake Breakfast in Arcola: Santa’s coming to Arcola for breakfast, $5 per person, on Saturday, Dec. 8. Stick around for a parade in downtown Arcola. Breakfast with Santa in Rantoul: On Saturday, Dec. 15 from 8 to 10 a.m. Free. Brunch with Santa and Mrs. Claus: For $15 (children under 3 are free), have brunch with Santa Claus and Mrs. Claus during the Festival of Trees on Nov. 17-18. Tickets required though online sales are closed. Pizza and Pajamas with Santa at the Douglass Community Center: $6 per person, but pre-registration is required so visit the link; from noon-1:30 p.m. on Saturday, Dec. 8. A Children’s Tea with Santa Claus: Saturday, Dec. 1, from 2-4 p.m. at Sylvia’s Irish Inn. Sandwiches and desserts, plus mugs of hot tea and hot chocolate. $25. Register here. Breakfast with Santa at Skateland: For kids 10 and under, advance ticket required, $10 per person. Limited to first 100 reservations. On Dec. 15 at Skateland in Savoy. Free Breakfast with Santa at FUMC: Pictures with Santa, breakfast, and crafts. FREE, but registration is required in advance; space is limited. Saturday, Dec. 8, from 9-10:30 a.m. RSVP to Bonnie at bberner@champaignfumc.org or call (217) 356-9078 by Dec. 6. Check back as we continue to add new events. Events sell out quickly, so if tickets are required, don’t delay.